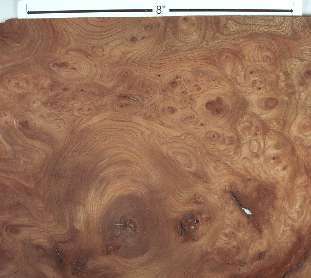 Ulmus campestris of the family Ulmaceae. 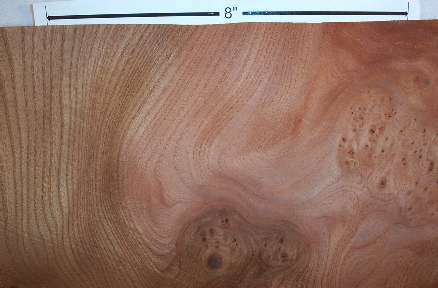 This is just plain old red elm that grows in Europe (one of its other common name is English elm). 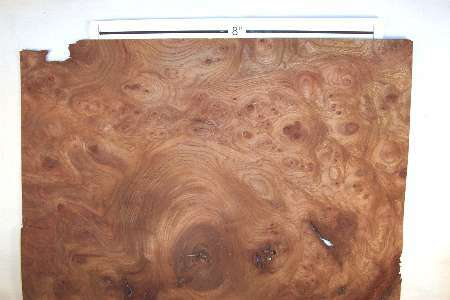 When sold as "Carpathian elm" it is almost always sold a burl. 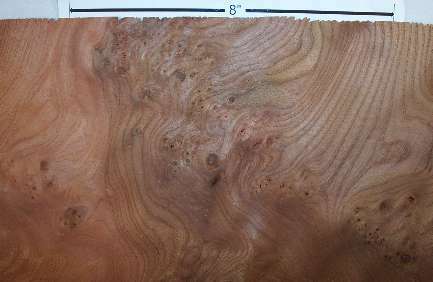 In non-burl form it is, as nearly as I can tell, indistinguishable from any red elm and thus when sold in solid form I guess it's just sold (usually) as red elm, not Carpathian. 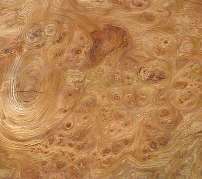 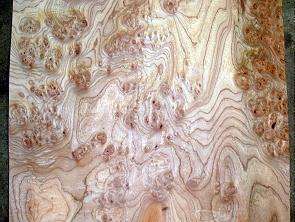 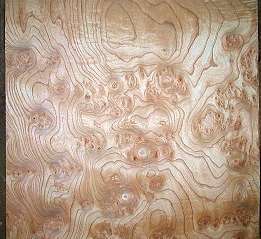 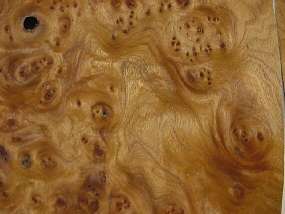 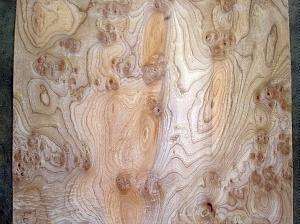 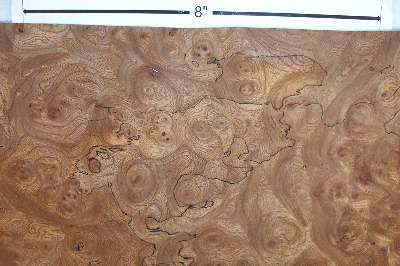 The burl form seems to be most common in the Carpathian mountains of central Europe, thus the name. 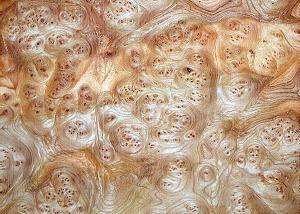 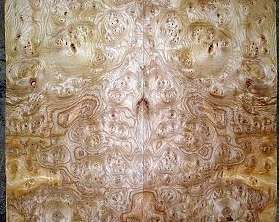 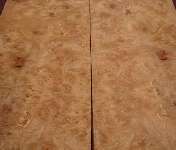 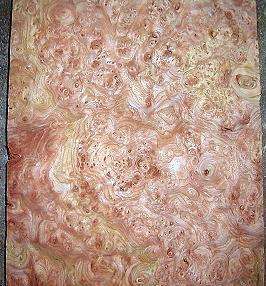 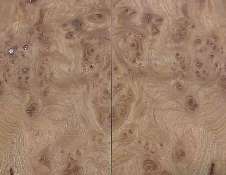 The burl is rarely found in solid form since veneer creates much more value for the same amount of wood. 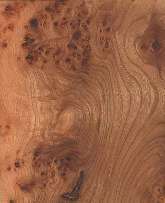 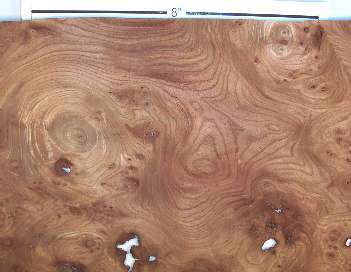 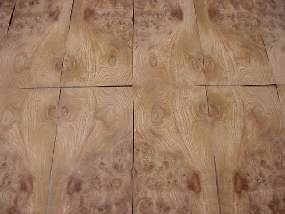 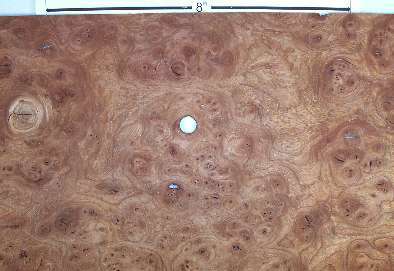 This is a very attractive (and quite expensive) as a veneer but it's difficult to work with due to inevitable small flaws (knotholes, or perhaps "burlholes" would be more accurate), extreme localized warping and extreme localized porosity. 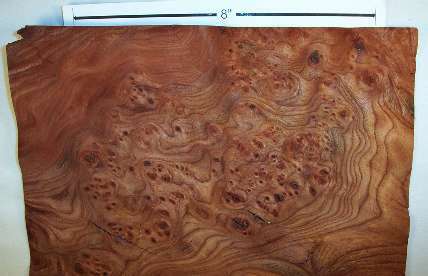 When held up to a strong light, the veneer will often show rich red patches which don't look red at all without backlighting and which are the areas of extreme local porosity which make finishing a problem since glue will seep throught these areas and bead up on the outer surface. 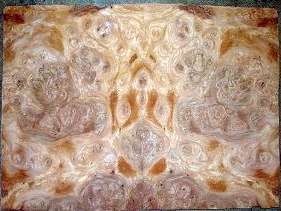 The glue seepage problem is aggravated by the fact that the warping creates a requirement that strong uniform pressure be applied during glue curing so as to avoid an uneven final surface. 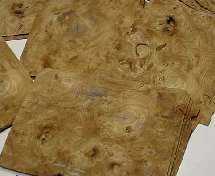 For very small projects (a few square inches), I've solved the problem by laminating two or more pieces of veneer together with plastic food wrap keeping the glue from seeping onto the clamping blocks and then sanding off most of the glue seepage. 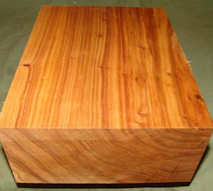 This isn't very practical for even moderate sized projects. 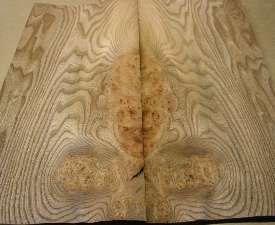 NOTE: The following two sets of pics of the solid form were contributed to the site by Mark Ottenberg, who sent them because for a long time, I had a statement on this page that I had not seen this wood in solid form. 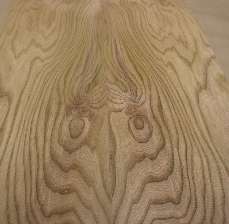 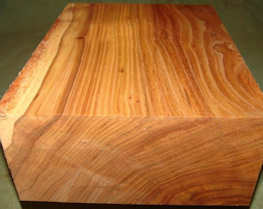 That was a statement from early in the life of the site and I did not at that time realize that the wood is just a form of red elm. 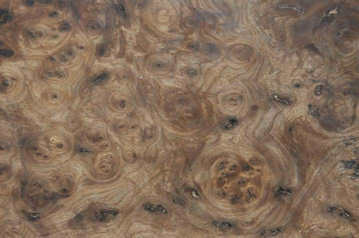 veneer --- This pic really didn't do full justice to the piece, although if you click to enlarge it the richness comes through a little better (and the first enlargement will make it closer to real-size on your monitor), so I added a pic of the same piece after I applied one coat of polyurethane to most of it. 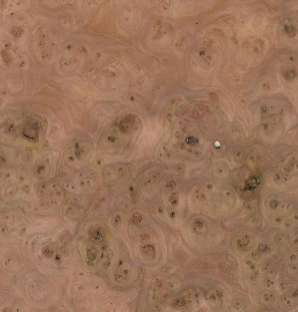 This burl veneer is used on the dashboards of expensive cars, because when finished it has an unusually rich look. 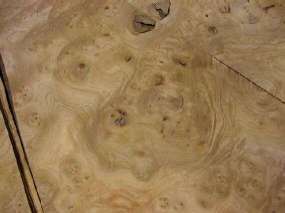 The holes you see in this piece are very common for this particular burl (and several others). 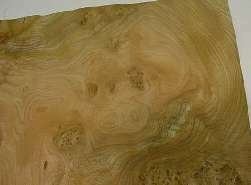 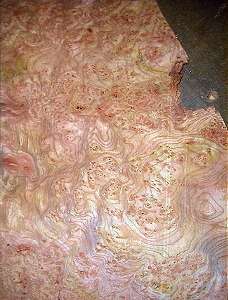 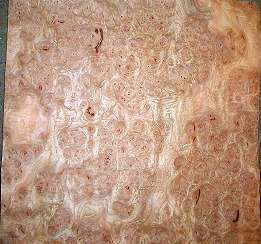 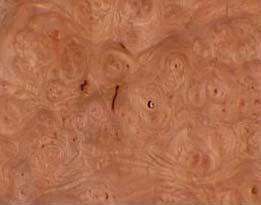 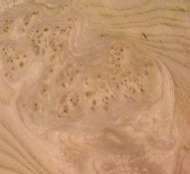 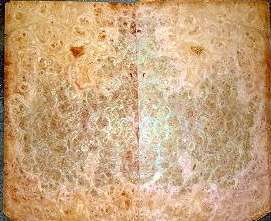 Like many burl veneers, it has to be flattened before use because after cutting, it develops fairly severe surface distortions. 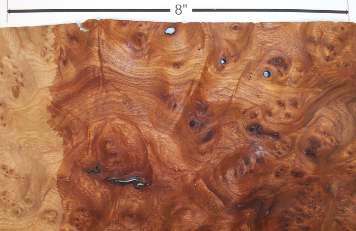 If you lay this particular piece on a table and put a piece of paper on top of it, the paper will be at least a quarter of an inch off of the table. 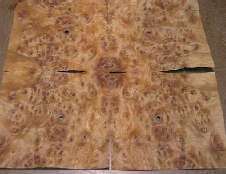 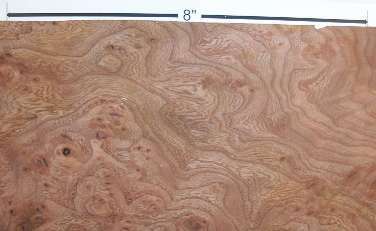 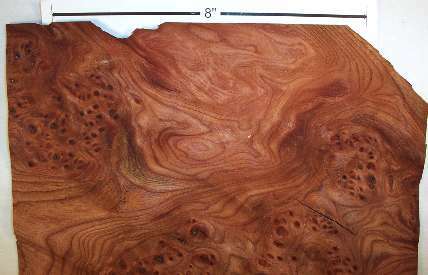 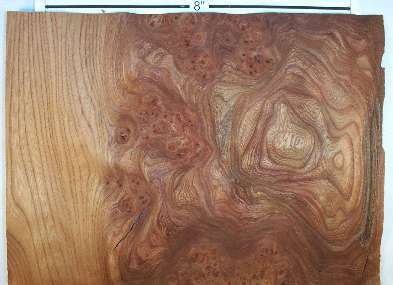 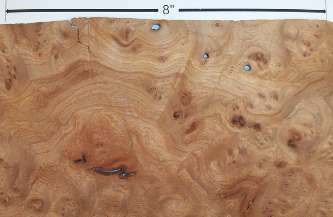 another veneer sheet --- color is accurate, and just as an observation, this sheet (and several other similar ones from the same lot) was almost perfectly flat, which is rare for many burls, including this variety. 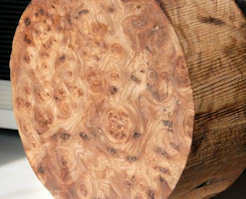 spalted burl veneer --- this is the only spalted carpathian elm I've ever seen. 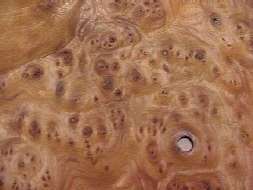 That doesn't necessarily mean that it is extraordinarily rare, just that I personally have only run across it (directly or by reading about it) just this once. 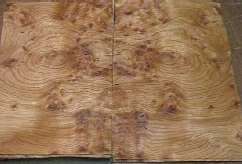 These are both veneers. 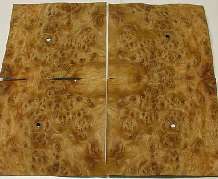 The total lack of holes in the first piece and the near-total lack of holes in the second piece is unusual, in my experience. 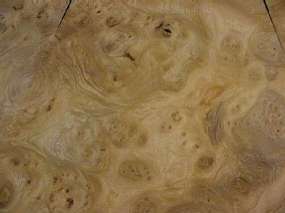 These pics seem to me to show a more boring burl than I'm accustomed to. 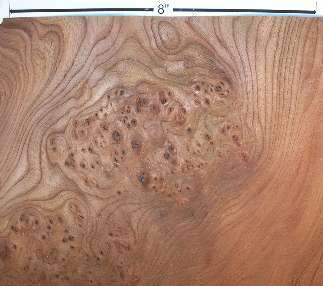 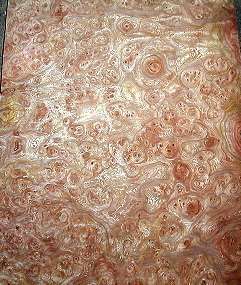 When I've seen this burl, it has looked more like my own sample than like these pics. 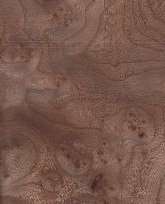 another set of veneer that does not look to me like any carpathian elm burl veneer I've ever seen. 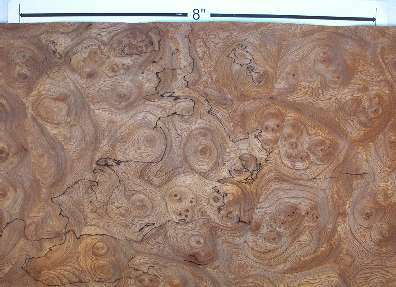 The grain pattern suggests that these pieces were cut from the edge of the burl, which might also explain the lack of holes. 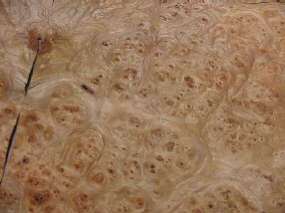 OK, NOW I've personally seen such burl veneer and it is a burl, just a less pronounced burl than most for this species --- that is, the burl is a swirly one instead of having the normal heavy eyes of this species. 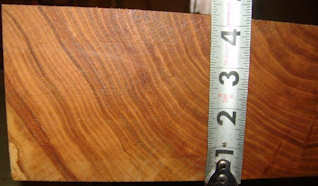 bowl blank and closeup; pics submitted by Jim Hendricks, whom I thank.